The Etrusco P40 Eco-Stitched Leather Pool Table comes with Free Delivery and Installation (worth £500), over £800 of Free Accessories, plus we are the sole authorised UK retailer. The Etrusco P40 is available as an English pool table using 2” red and yellow balls, or an American pool table using 2 1/4” spots and stripes balls as standard, with a sectional slate bed, available in 7ft, 8ft, 9ft, 10ft and 12ft sizes. Etrusco pool tables are exclusive to Home Leisure Direct in the UK. We are extremely proud to be able to offer these stunning pool tables, which look amazing and provide professional quality playability. 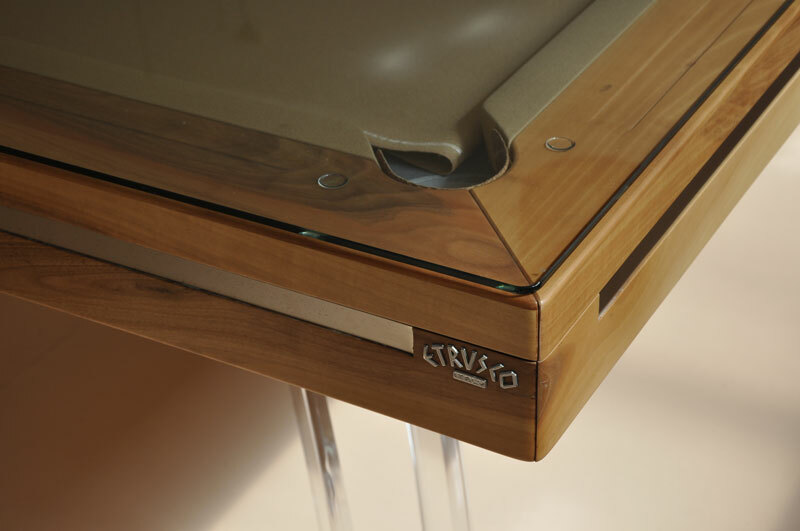 Whether your game is English or American Pool, Etrusco tables make a superb choice. The P40 has a sleek unassuming design, and great playing characteristics. The shape of the legs were inspired by the design of a river bridge in the company owner's home town. This table is supplied with or without a dining top. Should you decide to have a dining top you can choose between wood, glass and plexiglass. It is possibly the finest range of solid wood pool tables available in the market at present. It comes in the widest selection of sizes that we carry, there are five different sizes ranging from 7ft to 12ft. The 8.2ft version offers the choice of 4 or 6 legs, depending upon your preference. The 8.5ft, 9.3ft, and 9.5ft tables come with 6 legs as standard. The 9.8ft, 10ft, 10.7ft and 12ft tables all have 8 legs. These tables are made from solid wood. If you wish, you can specify that the balls, once potted, fall into steel trays protected with transparent film; this is available as an optional extra. As standard the table is fitted with matching leather pockets. The slate is 100% Italian and the cushions are tournament grade, made from Artemis rubber which is made in Germany. Whereas most tables are available in only English or American formats, you are able to choose which you prefer and we will have your table made especially for you. We would suggest English pool for the 7ft or 7.5ft versions, due to the smaller pockets and 2" balls which are used. For 8ft or larger then American should be your choice, with the larger more open pocket style and larger 2 1/4' balls. But, as ever, the choice is yours. This Eco-Stitched Leather P40 pool table is finished in eco-stitched imitation leather, with high-quality stitching. The body is still made from the same solid wood, but covered in a beautiful imitation leather finish for the ultimate in luxury. The Etrusco P40 pool table is also supplied with a high quality accessory pack, which you would expect when purchasing a table of this stature. You will receive the cues, balls, triangle, and chalk. You may have also spotted the rather stylish cue rack in the background - this is yours too, on its own this costs over £800 when bought separately. Etrusco pool and pool dining tables are all hand made by craftsmen in Italy, and finished to an extremely high standard. They look fantastic and are renowned as pieces of furniture not just games tables. They are solidly built to last in any environment whether it be in a commercial application or in your home. Several Etrusco billiard tables have been used in competitions throughout Europe. These beautiful tables are sought after by interior designers and professionals for many types of application. We are incredibly proud to have been chosen as the sole authorised UK retailer by Etrusco. The quality of workmanship is exceptional, when visiting their factory we were very impressed by their facilities and high standards of finish. For more models from this manufacturer, please see our Etrusco Pool Tables page. or 2" English Pool Balls if you select "English" when choosing your options. We are able to offer the P40 in a choice of 11 different sizes, enabling you to select the optimum size for the space you have or type of cue sports you prefer. This P40 features an eco-stitched imitation leather finish, which looks incredible. If you'd rather a wood finish, we can supply the P40 in a huge choice of finishes; virtually anything is possible. We offer a range of solid woods, which can be finished in a glossy laquered finish or in satin if you prefer. Please see our main P40 listing for details. If there is a special look you require please call our expert team on 0800 622 6464 to discuss your requirements. A choice of colours is available for both American and English pool options. We are able to fit your table with a choice of Premium cloth colours. The cloths are of the highest quality, and are manufactured by Hainsworth. This is a performance cloth that delivers big on value and longevity whilst offering excellent speed and ball response. Eco-Stitched Leather Dining Top - at extra cost: to match the imitation leather of the table. Please ensure you choose the correct Dining Top and Dining Top Size options from the drop-down menus when choosing leather dining tops. Glass - at extra cost: choose either inlaid into the cushion rail, or position on-top of cushion rail. Plexiglass Dining Top - at extra cost: choose either inlaid into the cushion rail, or position on-top of cushion rail. Please select the type of dining top you would like as well as the appropriate size for the table you have ordered. The dining tops are supplied in 3 pieces, to enable easy placement and removal. If the table needs to be made to order it will take approximately 4 to 8 weeks to be made. Once completed, our delivery team will contact you to arrange a delivery date.